Image credit: © B Dupont from Flickr. Some rights reserved. Pelage: Dark-gray or black with minimal body hair; color often obscured by soil and mud picked up in hairs while wallowing. Long mane of yellowish to black hair extends from the nape of the neck across the shoulders and onto the back. Range: Widely found in sub-Saharan Africa. Habitat: Prefer open-country; savanna grasslands, open bushlands, and woodlands. Absent from forests, thickets, cool montane grasslands, deserts, and steppes. IUCN Status: Least Concern. Widespread and often locally abundant, although no global population estimate and populations in decline across Africa. CITES Appendix: Not listed; low levels of international trade in live warthogs and warthog products. Population in Wild: Unknown in many regions. Approximately 22,250 in South Africa. Locomotion: Trot and run; back rigid, tail and mane held erect. Burst of speed up to 55 km/hr (34 mi/hr). Activity Cycle: Diurnal. Spend much of the day foraging. Wallow in mud and shelter in burrows to escape mid-day heat. Sleep in burrows at night. Social Groups: Live alone or in small groups known as sounders. Mothers often share nursing duty, providing care to one another's offspring. Diet: Feed mostly on grasses; eat the green shoots when seasonally available and the roots and seeds in drier weather. Also consume fruits, sedges, tubers, and bulbs. Uncommonly scavenge on stomach and intestinal contents at predator kills or chew on old bones. Predators: Primary threats are lion and leopard; spotted hyena, cheetah, and African wild dog also prey on young and adults. Lions known to become warthog specialists in some areas. Birth Weight: 480-850 g (1.1-1.9 lb); piglets from larger litters tend to weigh less. Age at Weaning: Complete by 21 weeks. Longevity: In managed care: c. 14 yr; longest lived individual > 18 yr. In the wild: seldom reach 12 yr. 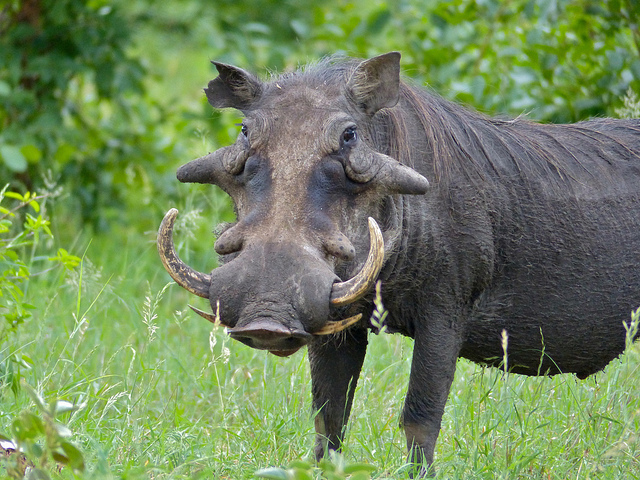 Feature Facts: Common warthogs are widespread across sub-Saharan Africa. Their nearly hairless bodies make for relatively easy identification of these pigs. Individuals often forage among other ungulates in open grasslands, where they can be seen dropped onto the front "knees" to pluck green grasses. The tusks are often used to dig for roots. © 2015-2019 San Diego Zoo Global. Minor updates to Population & Conservation Apr 2019.